US equities closed moderately mixed, sp +3pts @ 2100 (intra high 2101). The two leaders - Trans/R2K, settled higher by 0.1% and 0.2% respectively. Near term outlook offers a minor and brief retrace, but the broader trends remain powerfully bullish... ahead of the ECB QE-pomo program. A pretty tiresome start to the week... tomorrow can only be more 'entertaining'.. right? Despite breaking new historic highs, it has been a pretty tiresome start to the short week. Regardless of the exact close, market appears waiting for an excuse for a minor wave lower... and certainly a brief one. 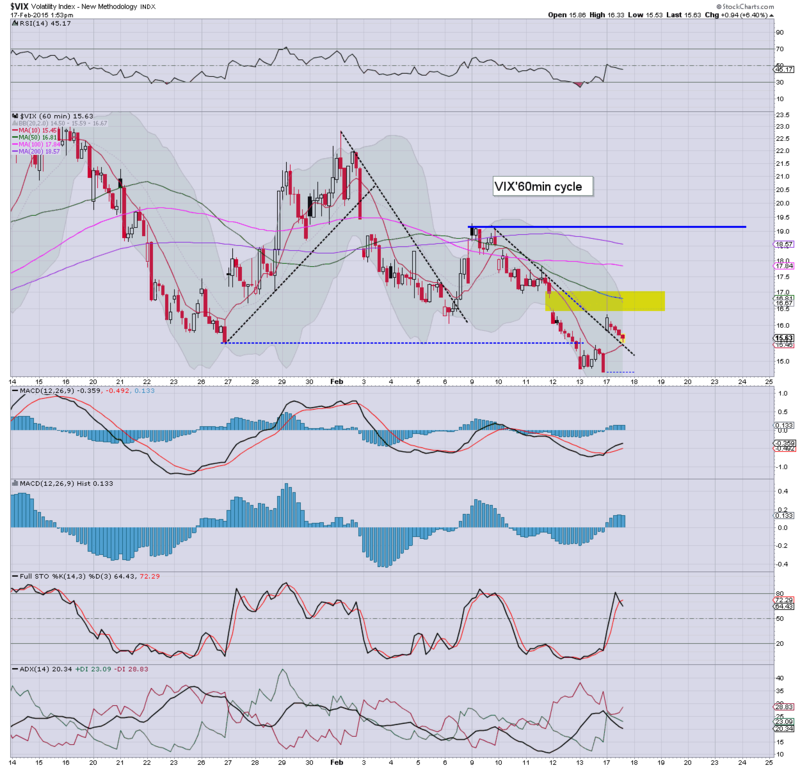 Metals remain weak, Gold -$20. Oil has turned higher, +1.7%... which certainly helped the market this afternoon. *notable gains in the VIX... but what will be more definitive is a break... AND daily close in the 17s. Until then... its all minor noise. The rebound in Oil today.. from -2.6% to +1.7% certainly helped give the market a kick. Like the precious metals though, I don't see a key low in Oil yet. With the market only opening a little lower, it was never going to be particularly difficult for the bulls to push higher.. and we have a new historic high of sp'2101. The R2K and Nasdaq are similarly in new territory. Despite the gains, VIX is holding moderate gains of 6% in the 15.60s. *yes, there are numerous reasons why the VIX will likely close net higher today.. despite the equity gains, but until we're back in the 17s... all the moves are of little importance. So... after a few months of waiting, we finally have the sp'2100s. No doubt, a huge number will start to top call across the coming days.. and weeks. Such people will entirely refuse to acknowledge the coming EU QE-pomo program, nor the capital flows into the US. I suppose at least they are consistant.. in their denial. 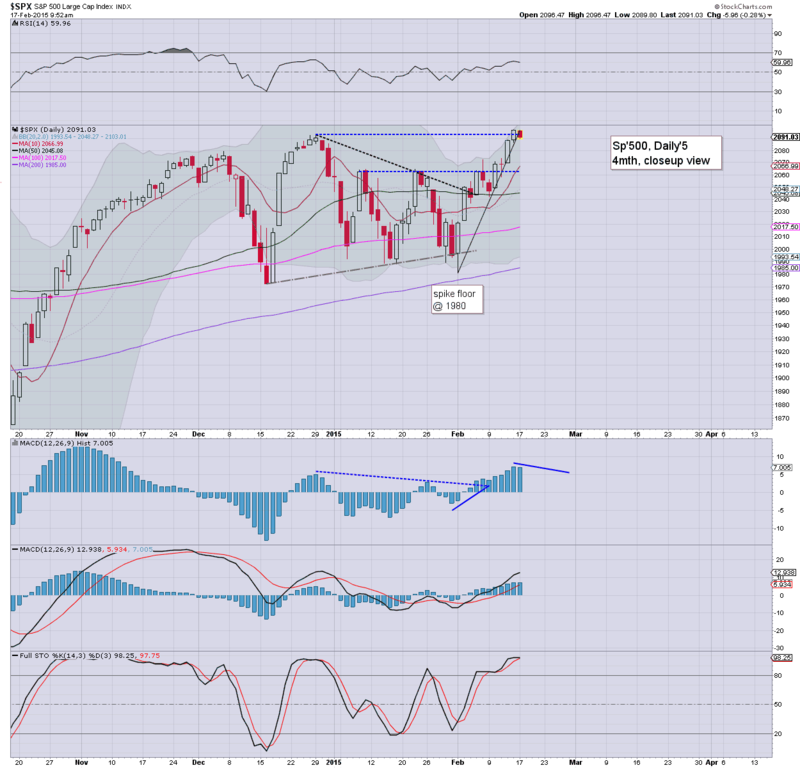 A minor equity retrace still looks viable... but that is all it will surely be. Equities remain in micro chop mode... awaiting the next headline from the ECB/Greece. Metals remain sharply lower, Gold -$22, with Silver -5.6%. Oil is similarly on the slide, -1.4%.. but as usual.. seeing some strong intraday moves. VIX is holding moderate gains of 8% in the 15.80s. *Silver seeing a rather severe decline.. but.. as expected.. set to break new multi-year lows within the near term. So.. market looks set for churn for the rest of day... barring a sporadic news headline about Greece. From a pure cyclical perspective, market is due a down wave.... although a break <2k looks extremely difficult. 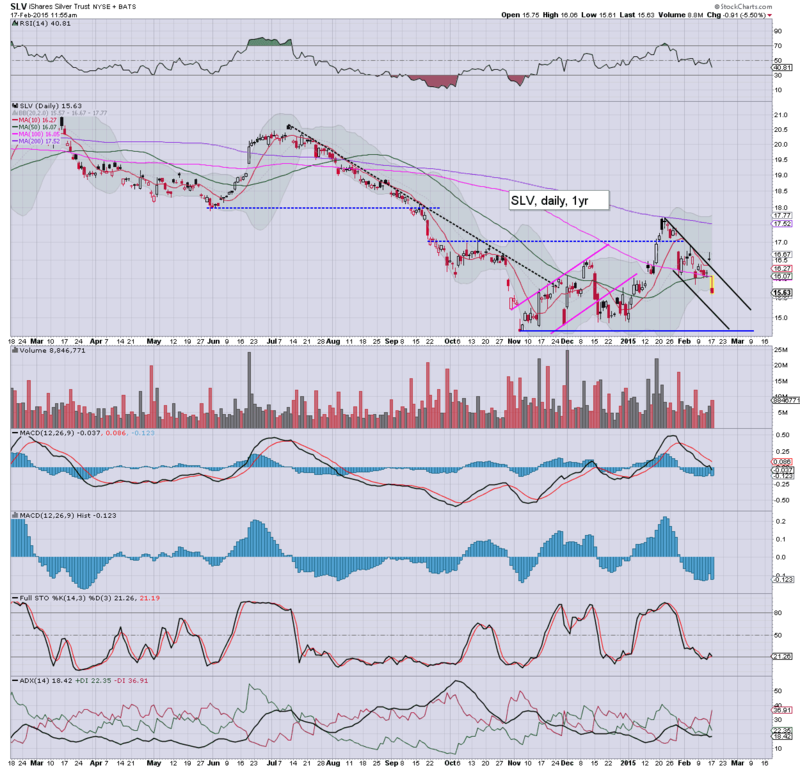 Perhaps sp'2050s, with VIX 19/20s... .briefly. I say briefly, since regardless of Greece, we've not forgotten the ECB QE-pomo train appears next month, have we? 1.20pm... and there are the sp'2100s.... sure took longer than expected... but there they are. 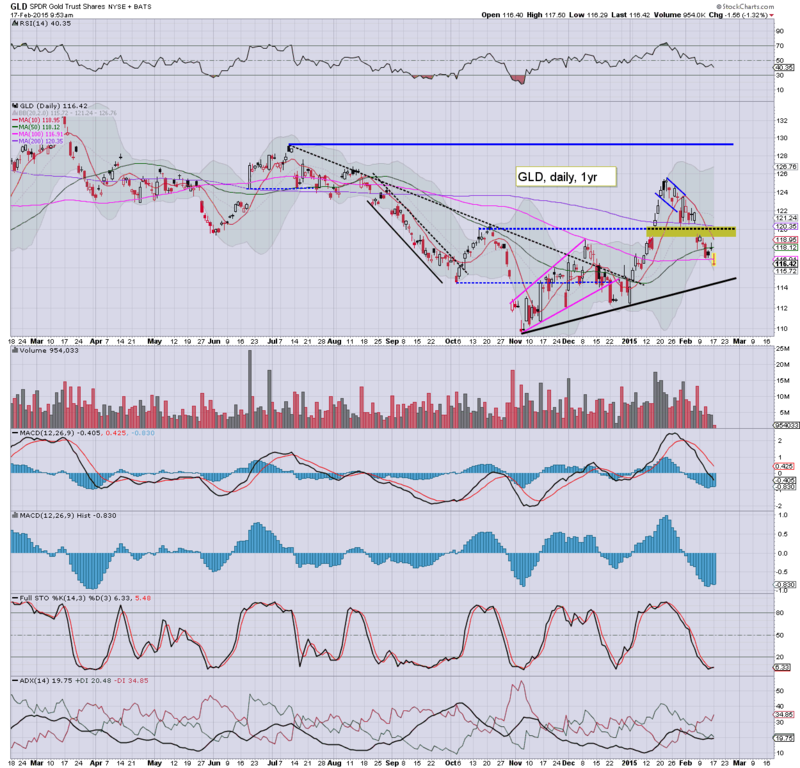 *Metals remain highly amusing, with Gold/Silver smacked lower on major volumn. I guess some might say that the Gold bugs are paying the price for spouting their lies across the weekend. They know who they are. Equity bears - in many ways, should be content with any flat close. 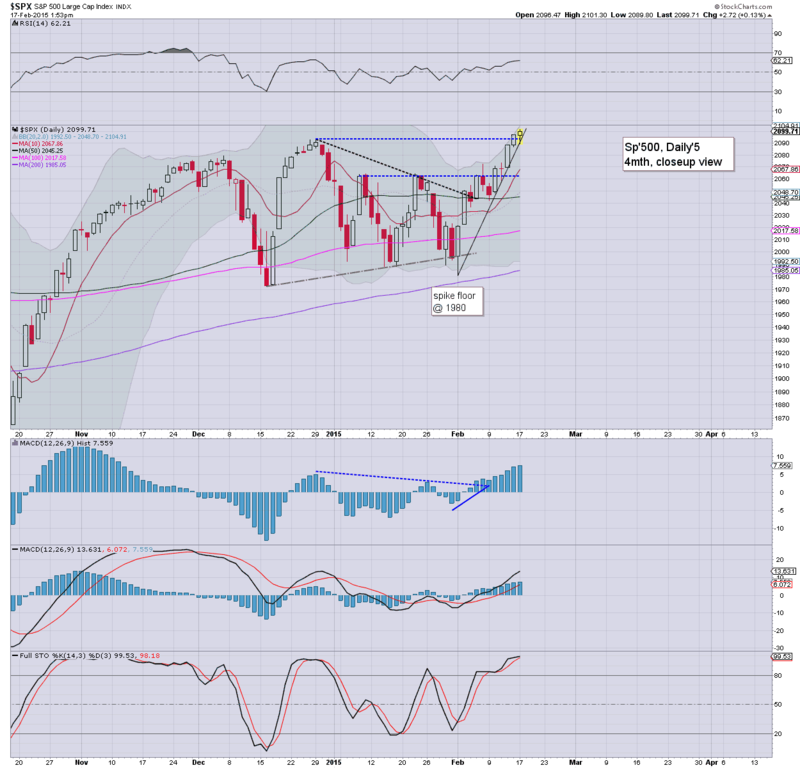 Merely stopping the recent ramp from sp'1980 would be a start. Right now, clearly. it is going to take a major 'spooky' headline for this market to see a major net daily decline.. and that sure doesn't seem at all viable today. 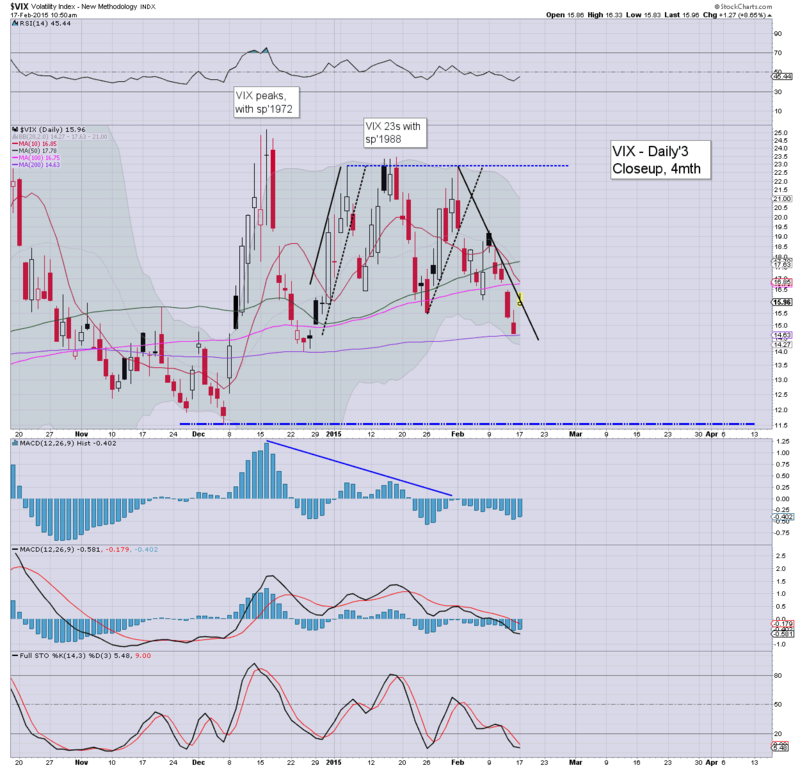 As for the VIX, until I see a daily close back above the gap zone (17s)... it remains broadly weak. Notable weakness, DRYS -4%.... no doubt the BDI is set to fall into the 400s before month end. US equities open a little lower, but clearly.. this is nothing remotely significant. Metals are sharply lower, Gold -$17, with Silver -5%.. the underlying strength in the USD will always be a problem. Oil is on the slide, -2.2%. VIX is +11%, but still only in the low 16s. So... we're a little lower, but clearly. it is NOTHING for the equity doomer bears to get excited about. 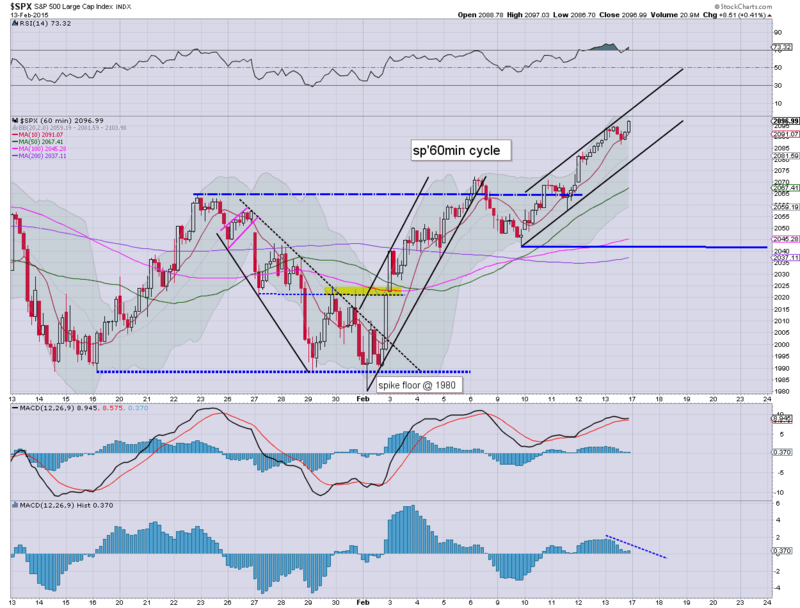 It is notable we have the MACD cycle on the daily equity index charts starting to tick lower. At the current rate, we'll see a bearish cross tomorrow... or certainly by Thursday. As ever though.. Market is going to be remain extremely vulnerable to sporadic comments from the ECB/Greek Govt. 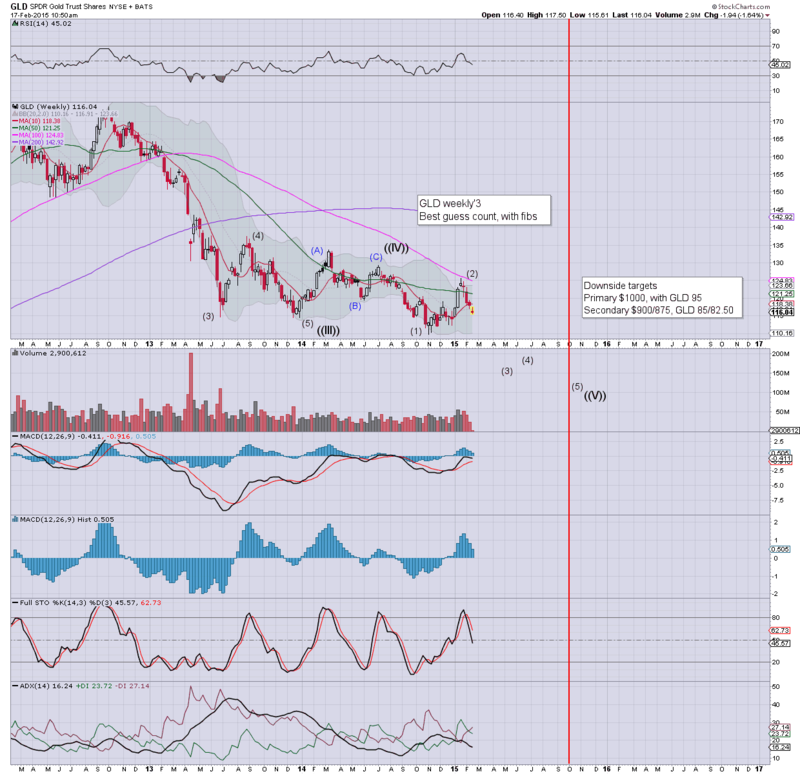 Notable weakness: RIG -3.3%.. having cut its dividend. Good morning. Futures are a little lower, sp -4pts, we're set to open at 2092. Metals are weak, Gold -$5. Oil is flat. Mr Market remains awaiting a finalised EU/Greek deal, although that could easily drag out until end month. Well, there really isn't much to note. A relatively quiet start to a short week, not least with continued uncertainty over Greece. They'll surely agree to something, but increasingly, it looks like they will drag it out until end month. Even another two weeks of waiting though might still allow market to continue what is currently algo-bot melt mode. 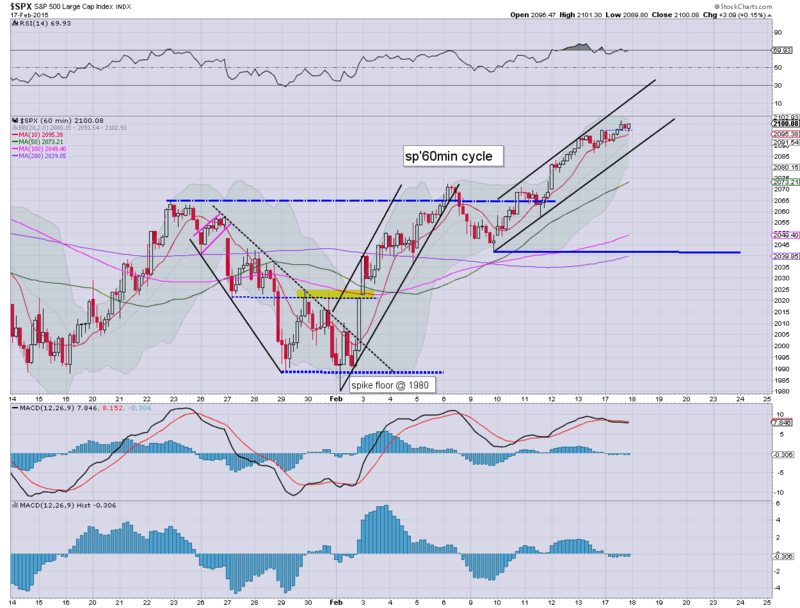 With EU QE-pomo set to start next month, time window for a minor retrace is very narrow. The notion of sub sp' 2k is now rather ludicrous.